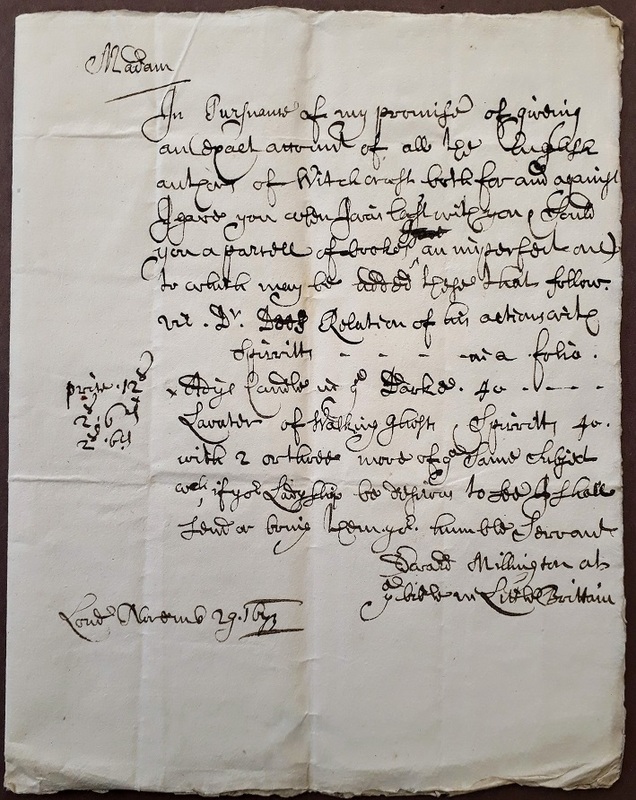 The Bodleian Library has acquired an extremely rare autograph letter by the 17th-century English bookseller and auctioneer Edward Millington. The letter, dated 29 November 1673, is only the second known item of correspondence in Millington’s hand and represents a significant addition to evidence of book trade in this period, not least because Millington’s correspondent is both a researcher of witchcraft and a woman. The addressee is “the Lady Gerhard at Mr Sanders a woollen draper in York Streete near Covent Garden” ; most probably Lady Jane Gerard, née Digby, baroness of Bromley. At the time the letter was written Lady Gerard had already lost her first husband, Charles Gerard, 4th baron Gerard of Bromley (d.1667) and was yet to marry her second, Sir Edward Hungerford (1632-1711). Lady Gerard’s discovery of a ‘healing spring’ at Willowbridge in Staffordshire would be recorded in 1676 by her chaplain Samuel Gilbert in a pamphlet entitled ‘Fons sanitatis’ (London, 1676). She died in 1703. The present letter reveals Lady Gerard to have had a serious interest in writings on witchcraft; tantalisingly, it seems to have been part of a longer correspondence with Millington, the rest of which is now lost. In it he recalls having promised Lady Gerard “an exact account of all the English authors of witchcraft both for and against,” and mentions a previous “parcell of books” sold to her. Millington himself was well placed to advise on such a topic; in 1669, he had published John Wagstaffe’s ‘The question of witchcraft debated’ out of the print shop he ran at the sign of the Pelican on Duck Lane, Little Britain. By the time of this letter he had moved to his later premises, at the sign of the Bible, but was yet to make his name as an auctioneer; a career that would see him described by Thomas Herne as “certainly the best Auctioneer in the World, being a man of Great Wit and Fluency of Speech… [though] very impudent and saucy” [DNB]. By 1673 Millington was evidently active in the second-hand book trade; the purpose of this letter to Lady Gerard is to provide a list of further books he was able to supply, with prices. These include “Dr Dees Relation of his actions with spirits,” probably ‘A true & faithful relation of what passed for many yeers between Dr. John Dee […] and some spirits’ (London, 1659); “Ady’s Candle in the Darkness,” i.e. Thomas Ady’s ‘A candle in the dark: or, A treatise concerning the nature of witches & witchcraft’, first published London 1655, and “Lavater Of Walking Ghosts,” which must be an English translation of Ludwig Lavater’s ‘De spectris, lemuribus et magnis atque insolitis fragoribus’, such as the one published in 1596 as ‘Of ghostes and spirites, walking by night, and of straunge noyses, crackes, and sundrie forewarnings, which commonly happen before the death of men…’. 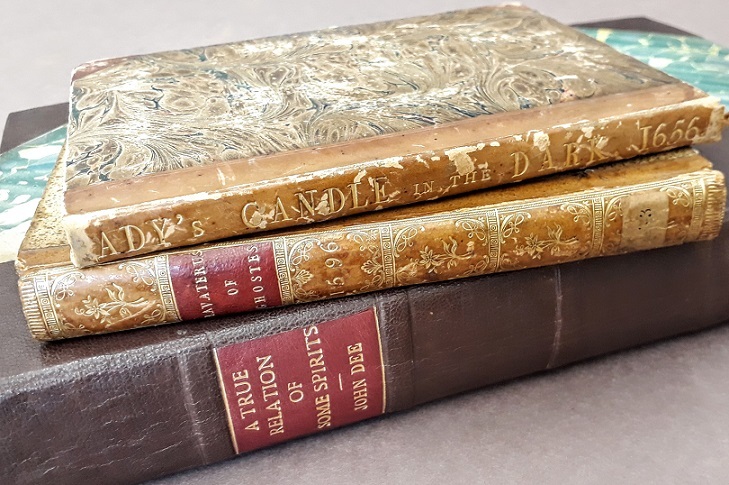 Copies of all three of the books recommended by Millington are available to researchers at the Bodleian – soon they will be able to consult them alongside Millington’s letter of recommendation.